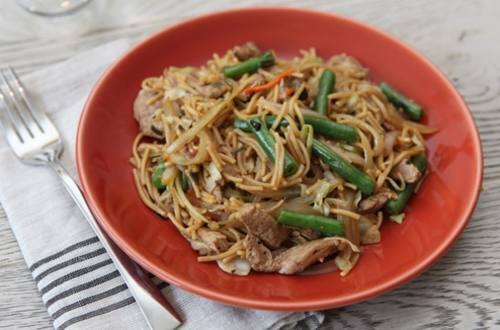 For a pork recipe with Asian influences, try our Pork, Napa & Green Beans With Lo Mein Noodles. Indulge in a Lo Mein dish with a medley of mouthwatering flavors like Teriyaki, pork, orange and many others. Okay, who's hungry? 1 Heat olive oil in a large nonstick skillet over medium-high heat and cook pork with garlic about 4 minutes or until done. Remove and set aside. 2 Add onion to same skillet and cook 2 minutes. Stir in water and orange juice and bring to a boil. Stir in Knorr® Asian Sides™ - Teriyaki Noodles and return to a boil. Add green beans, reduce heat to low and simmer covered 7 minutes or until noodles are tender and green beans are crisp-tender, stirring occasionally. Stir in 2 cups shredded cabbage and reserved pork and cook 1 minute or until heated through. 3 To serve, arrange remaining cabbage on serving platter, then top with noodle mixture. Garnish, if desired, with sliced radishes and sliced orange wedges.